– Podcasting was “the next big thing” a few years ago and then failed to hit the mainstream but now appears to be enjoying a rapid renaissance. What do you think is behind that? It was big but not, until recently, mass market. By 2014, Apple had one billion podcast subscribers – that’s big and it was pre-Serial. Serial was released in October 2014. Podcasting had difficulty reaching a mass, generalist market because lacked a leading brand. Then the NPR podcast Serial came along and it was a phenomenal success. There was a bandwagon to jump on, something for people to talk about and suddenly people wanted to know about podcasting. I stated making podcasts in 2008 (maybe before), and it was at times tricky to do and not easy to find podcasts to listen to. The general audience didn’t seem to “get it”. She also says (and I think this is very important) “… many journalists covering this space overlook a vital factor in Serial’s success: just a few weeks before the show’s launch, Apple updated its mobile operating system, iOS, to include a native, undeletable podcast app. But I think podcasting is not about mass market – although success in the mass market helps everyone and raises awareness. I think podcasting is about the niches that radio does not serve or are too small to be commercially viable. Even if everyone does the work for free, radio (transmitters, kit, licences) is, compared to podcasting, expensive and much less flexible. So perhaps it was the next big thing people didn’t know about! – Where should new podcasters start? Do you need a proper microphone and editing software? If so, is there any good entry level kit you could recommend? This is another reason podcasting didn’t reach the general public’s consciousness. You don’t start with the kit, which is what people even now still think. You start with the story and the passion to tell the story. Get to know your audience and understand what they want to hear. 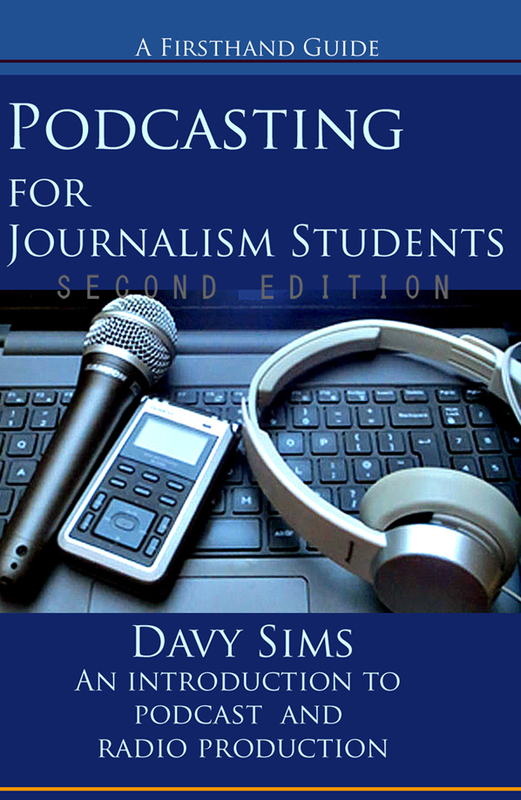 Journalists and anyone wanting to produce a podcast should be thinking about the kit they need to support their reporting or storytelling. So much is going to depend on what you want to do. If it is a roundtable discussion a Blue Yeti Pro Studio into a Mac might be all you need. If you want to build reporting or outside interviews you will need something different. If you are starting with no experience or knowledge, start cheap and learn. Invest later. Recording. Later you will want to get the best recorder and microphone you can afford. If you have a smartphone and a computer, you can start there. Record your interview on your phone (remember where the microphones are – people sometimes point the wrong end at the interviewee). Transfer and edit. Editing: The digital editor Audacity is free, easy and a great way to learn. There are communities of Audacity users, YouTube videos and websites what will help you. Mac users will have Garageband – it is excellent and again users and websites are there to help. Do learn to edit. And when you are telling your story edit and edit and edit to get it right. Recorder: I would buy either a Zoom H2N (c£150), Tascam DR-100MKII (c£300) or what I use and Edirol Roland R-05HR (c£160). They have good built in microphones. A separate mic will be useful. Make sure the connections are correct – the Edirol has a minijack for the mic, the Tascam has xlr connection. Overall try hard to find a good sound. There are a couple of podcasts from leading publications which I have stopped listening to because they are badly recorded or ramble (or both). But, you are not producing high quality music – your podcast will be compressed as an MP3. Is it clear or is it muddy? Muddy = bad. Does it sound as if it just might come from Radio 4? My advice on kit? Research, research, research then go ask someone who knows. – Do you need a USP for a podcast or should you just start podcasting and then see what your listeners like listening to? Again, what is the story you want to tell and who do you want to hear that story? Do it for yourself – tell the stories you want to tell and get to know your audiences and find out stories they want to hear. – In your experience, what type of content works? The same type of content that works on radio or something else? Passion, stories (well told), knowledge. Can you tell the audience something they don’t know, or have you a new way at looking at an old subject? Obviously, some major radio brands do well as podcasts. People use them to timeshift for their convenience. But podcasts will not or are not intended to be broadcast. So, you can target your audience more clearly. In podcasts as well as radio they key is to be yourself. 1 – Be interested, 2 – Be interesting, 3 – Be attentive to how it sounds. – What are the best ways of getting your podcast content discovered? Do you just produce good content and hope for the best, do you need to network shamelessly or are there paid options to boost your reach? A detailed article could be written to answer this question (and all the others). There are many ways to reach and expand your audience. Write (email/Facebook/Twitter) to everyone one you know who might be interested. Compose a mailing list using you own email system or something like MailChimp. Add the URL to your email signature. Write on message boards, promote other similar/interesting podcasts in your social media. Negotiate alliances with other podcasters. In short, there are many ways to market and promote your podcast. You can either do it randomly (less effective) or develop a promotions strategy (more effective) You won’t need to spend money, but you will need to invest time and thought. – I am sure this is a question you are asked constantly but what length and frequency of podcast work best? Yes, but they are important questions. There is no absolute answer to them. Length. Just because you have almost infinite time, do not think you can fill infinite space – no one is that interesting. On the other hand, you don’t have to fit into a fixed time slot (there are no “pips” in podcasts), but aim for a consistent time – around the same time for each episode, and probably think in 20 minute segments. Listeners can put down and episode when dog is walked or the bus has stopped, and pick up again next time. Frequency. I break this rule every time. It will depend on your subject and how long it takes to prepare the podcast. But generally, once a week is good perhaps have an occasional update between episodes if there is something worth saying. – Any other advice for would-be podcasters? Most likely people are going to be listening using headphones; you are going to be in their head so make sure you are putting your best there; the best recording, the best editing, the best story and the best you. Then listen to your audience, find a way to create feedback – blog, social media, email. Your audience has listened to you, now listen to them.